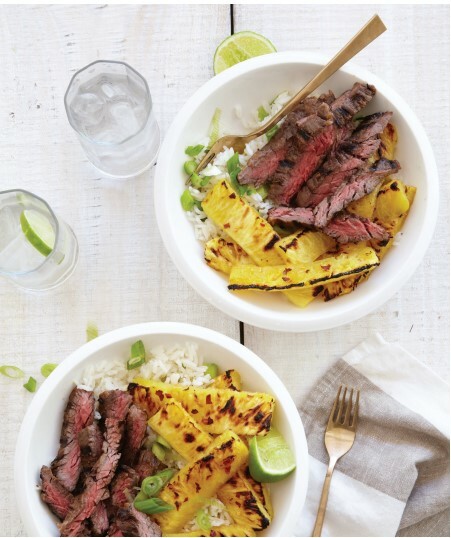 There's nothing quite as savory and satisfying as a juicy grilled steak – but not everyone has the time and resources to fire up the outdoor grill. Fear not! The Terra's Kitchen Big Island Steak Bowl recipe provides easy, step-by-step instruction with indoor grilling , so you can perfect this gourmet specialty at home. This recipe makes 2 servings and each serving contains 560 calories. It's an excellent source of fiber, protein, vitamin C and iron. Preheat oven to broil. Line a baking sheet with foil and set aside. Zest half the lime. Cut lime in half. In a small saucepan over high heat, bring 1 and ¼ cups water and ¼ teaspoon salt to a boil. Stir in rice and return to a boil. Reduce heat to low, cover and simmer 15 minutes. Turn off heat and let sit, covered for 5 minutes. Fluff with a fork and gently stir in sesame oil, zest, juice from half a lime, all except 1 tablespoon of the scallions. Cover and set aside. While cooking rice, place pineapple in a single layer on a foil lined baking sheet and brush tops with 1 teaspoon oil. Lightly sprinkle with salt. Broil until charred in places (about 15 minutes). Remove pineapple from oven and sprinkle with the remaining brown sugar and as much of the red pepper flake as you can handle. Set aside. Rub a grill pan with 1 teaspoon of canola oil and place over high heat. In a small bowl, combine half of the soy sauce, half of the brown sugar and ½ teaspoon salt and ¼ teaspoon pepper. Rub mixture over steak. When grill starts to smoke, add steaks and cook to medium rare, turning once (3-4 minutes per side). Remove to a plate and allow to rest for 5 minutes. Thinly slice against the grain. To Serve: Divide rice and pineapple between two bowls. Top with sliced steak. Squeeze lime juice over and garnish with remaining scallion and crushed red pepper (optional). Wine Pairing: Pineapples are a bear to pair. You can't go wrong with a dry German Riesling. Beer Pairing: This cool salad bowl calls for a cool beer! Serve up a smoked bock beer like Aecht Schlenkerla Rauchbier Urbock. These are very detailed directions that are easy to understand and follow. I happen to have some skirt steaks in my freezer and I may try this recipe soon.